I’m not the only one who thinks this way about riding a piece of bamboo with wheels and a motor. YouTube personality and entrepreneur Casey Neistat made it his main form of transportation around the city. 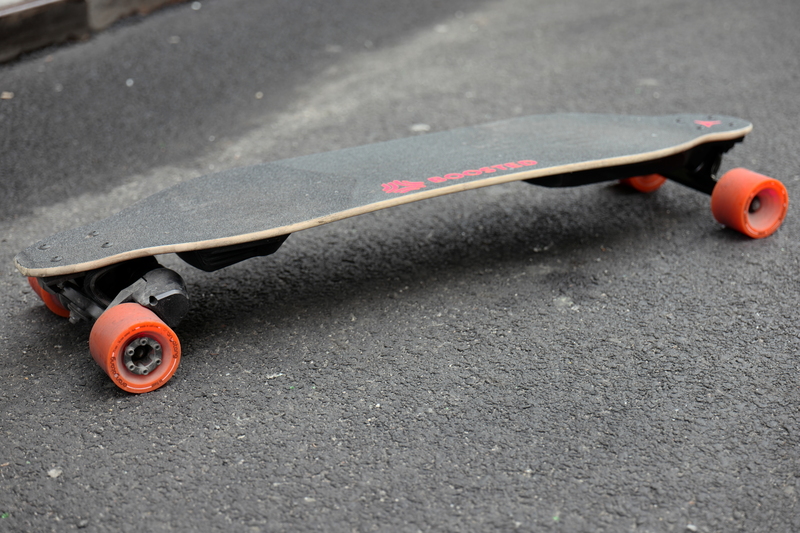 If you’re a daily watcher of his vlogs, then you’re all too familiar with the Boosted Board, specifically this exact model. Its design is every bit as functional as it is fast. 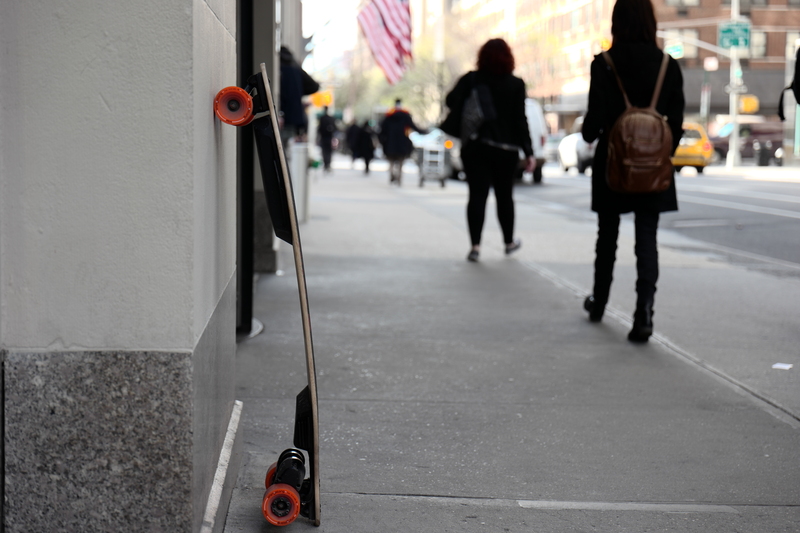 Even if you were a passer-by and had no idea that the Boosted Board was an electric skateboard, there’d have to be some compliment offered toward its appearance: after all, it’s not ugly. The board itself is designed to be sleek, with an outward curvature (on either side) originating from both ends, which evens out toward the middle. At certain angles, you can’t tell it has a battery or a motor. 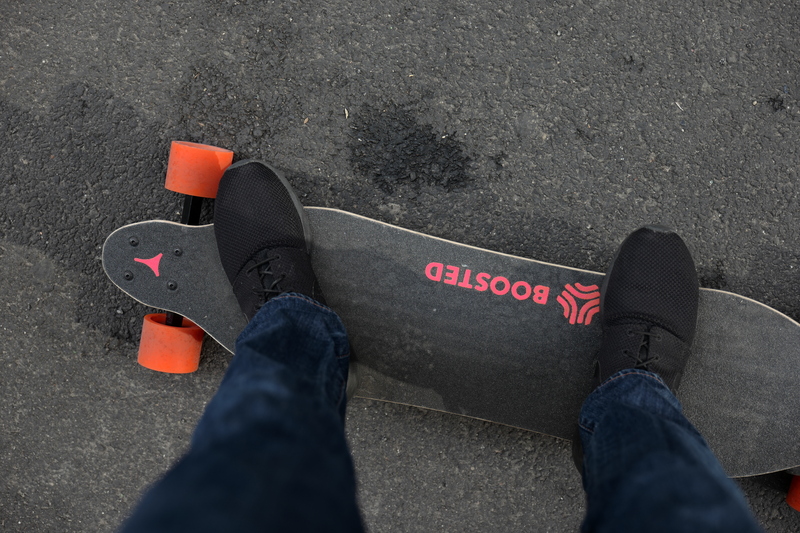 Despite being a large deck (it’s a longboard, after all), Boosted opted to keep the battery and motor enclosures as sleek as possible. This is also done for rider comfort: both sections are mounted slightly above the deck’s surface, so that when it flexes nothing else is damaged. The result: better absorption of shocks. Note: Boosted Boards aren’t waterproof, something I’ll speak about later. As for the Bluetooth remote: there are three inputs: a safety button (must be pressed to move), scroll wheel (the throttle) and a multi-function button (turns the remote on, shows range and switches between riding modes). It uses a rather old USB plug to charge (the mini B) and I can’t understand why it does. Otherwise, it’s the least impressive part of the kit, something I wish the designers paid more attention to. But it works well and that’s most important. At first, commuting on the Boosted Board is both exciting — and terrifying. With my smartwatch as a navigator, I made several 67-block commutes from my dormitory in the Upper West Side to school at Columbus Circle, for an entire week. 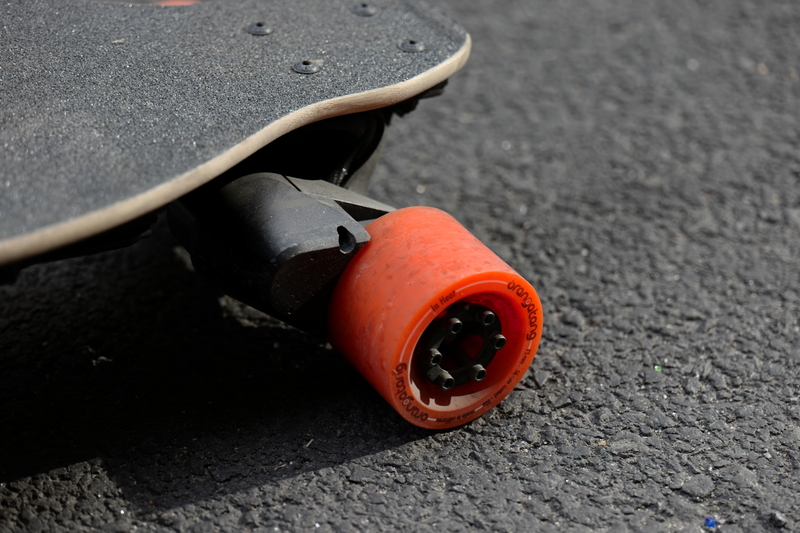 The Boosted Board became my primary means of transportation for most of my errands and obligations, and that’s how I learned to live with its varying mileage. It felt adventurous and irresponsible, which is how I’d describe riding the board to friends and strangers. How far does it go on a single charge? That’s very subjective — the range depends on which mode, the incline, weight of the rider and throttle usage. Moreover, I ride exclusively on “Pro mode,” so I am not conserving as much energy as I should; the trade-off is getting from point A to B in no time flat. My swiftness is not only because I’m comfortable riding it, but because I have the best version of the board: $1,299 and $999 versions only have top speeds of 20mph and 18mph, respectively. Riding the Boosted Board makes people happy — there are smiles, surprised faces and questions all around. More often than not, with “Pro mode” activated I would reach the top speed of 20mph, and make use of the bike lanes, main streets and the Westside Highway. My range is between 6-8 miles on a single charge, meaning that the board will only last a one-way trip. Solution: bring the fast charger. 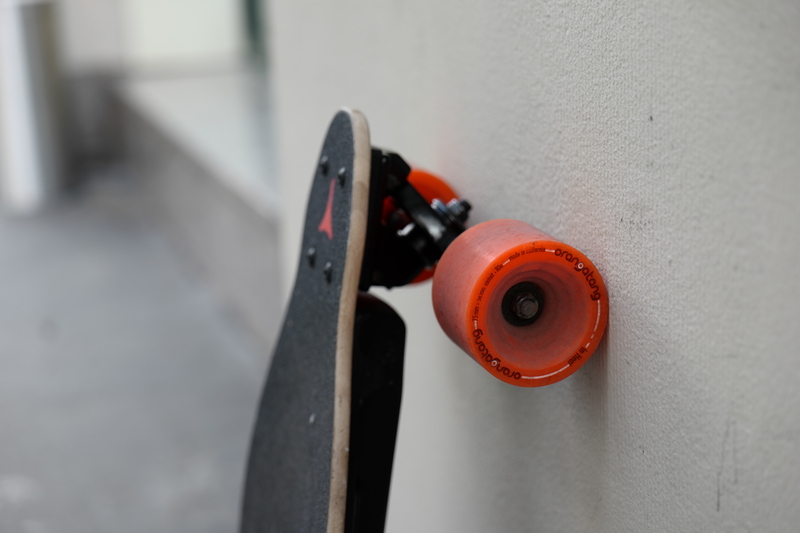 It’s not incredibly heavy or large, and charges the Boosted Board from naught to full juice in one hour, or 85 percent in 30 minutes. Of course, bringing a two-prong charger everywhere might feel counter-productive to some, but it’s a fact that you’re racing through town (at near the city speed limit) and it’s awesome. Of course, there are things I wish the Boosted Board was better at: riding in the rain (it’s dangerous, messy and ill-advised) and better range (or an interchangeable battery?). 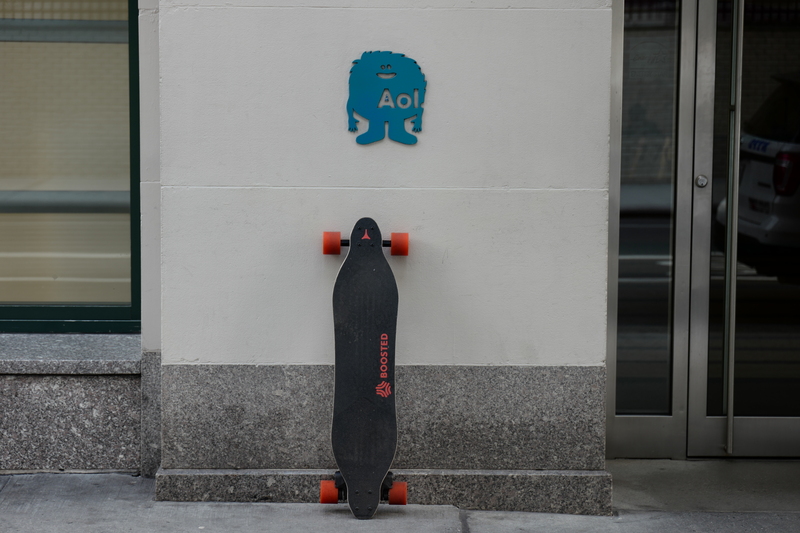 But, then again, for a first-generation product, the Boosted Board is as refined as can be. Should you buy one? Absolutely. But, have you ridden a skateboard before? Do you have some backbone to filter between cars or take some bumps along the way? It’s an expensive toy — a useful and wonderful toy. Even for experienced riders, the Boosted Board takes some learning curve to master fully (go slow!) and only then can you start cycling through the riding modes and really start flying through the city. The short range leaves something to be desired, but a fast-charging battery takes some of that inconvenience away. After all, the reward of beating (and avoiding) the NYC subway can’t be beat. Riding the Boosted Board is about style and speed; the result being pure fun. As for personal sentiment? If I see a fellow rider in the street, be ready to race: I can beat Ubers off the start line.